New dancers don’t realize how important foot position and technique really is: not only does it help you dance well, but if you are dancing on a raised stage, the audience has quite a good view of your feet! Let’s focus on Foot Positions that work well AND look beautiful. As I mentioned in the last article, I didn’t think about feet myself until I read about “bad foot technique”. From then on, I DID “look down” at my feet to see what they were doing. Belly dance is not just from the hips up! In belly dance, our “working positions” often double as “static positions” (poses), and carry some weight on each foot. There are only a few positions where the weight is ALL carried on one foot. Below, here are the basic poses I mentioned in the previous article, both right and wrong: Figure One is correct; Figure Two is the awkward-looking “duck feet” pose. Figure One is our Basic Stance, best used for training beginning students. In this position you can begin to feel your weight and keep it stabilized while drilling hip and upper body moves and increasing your body control. When dancing, though, we typically don’t spend a lot of time in this position; the reason is twofold: most movements use variations of this pose; plus it’s not as aesthetically pleasing as another pose we’ll see later. Figure Two - this should be corrected right away. Not only does the “Duck Foot” position stress the knees, but it looks awkward, which is the opposite of “graceful” - need I say more? 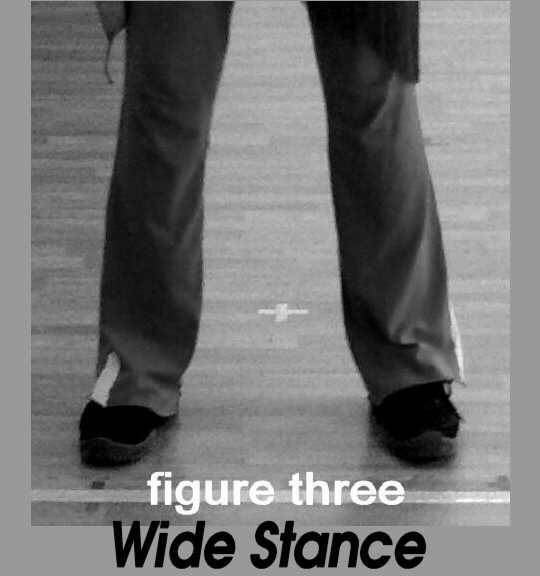 Figure Three below shows a working position best used for moves that turn or twist the torso while changing weight, or for movements that extend the hips past the width of the feet. The toes and knees are angled out slightly, in alignment. At first, think of the toes as pointing straight ahead to avoid too much angle, which is a common mistake. In this wide-stance position, the middle or ball of the foot is carrying most the weight; the heel is lightly on the floor and can be lifted slightly as the torso or hips turn or twist, which causes the foot to pivot. These are the movements that can cause knee pain and damage over time, so as I mentioned in the previous article, be aware of your dancing surface and how easily your foot can pivot. The feel of weight change comes over time, beginners usually aren’t aware of it. Why not develop your awareness now? It’s interesting to feel the flow of energy through your feet (and your body), and any awareness of energy flow is going to heighten your artistic expression. Did you know so much was going on “down there”? 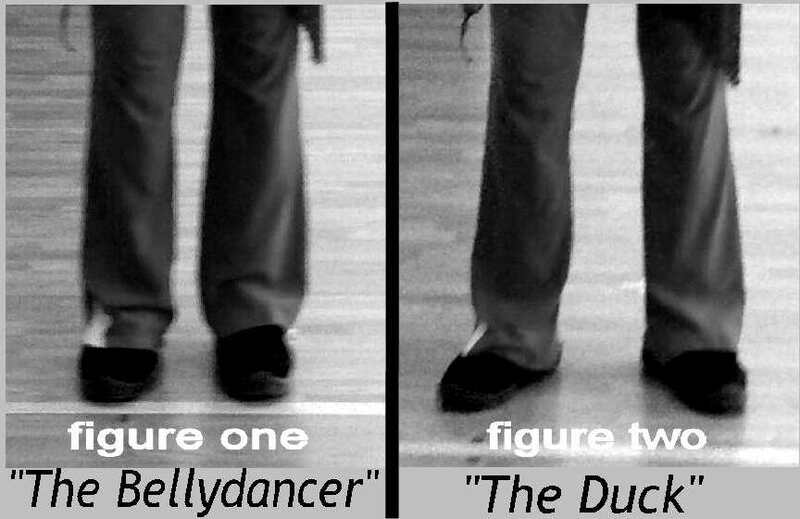 We’ll continue in the next article with more foot positions for better belly dancing.